There are few crop inputs that deliver as much return on investment as nitrogen fertilizer. It takes approximately two pounds of nitrogen, costing approximately $1.00, to produce one bushel of grain worth about $6.00. Of course, nitrogen is not the only yield determining factor in a wheat crop. Also, the law of diminishing marginal returns eventually kicks in, but nitrogen fertilizer is still one of the safest bets in the house. Top dress nitrogen fertilizer is especially important because it is applied and utilized at a time when the plant is transitioning from vegetative to reproductive growth. Several things, including the number of potential grain sites, are determined just prior to jointing and it is imperative that the plant has the fuel it needs to complete these tasks. Jointing also marks the beginning of rapid nitrogen uptake by the plant which is used to build new leaves, stem, and the developing grain head. The nitrogen stored in these plant parts will be used to fill the grain later in the season, and the plant is dependent on this stored nitrogen to complete grain fill. In the bullet points below, I will hit the major points regarding top dress nitrogen for wheat. I have also posted three slide presentations with audio regarding topdressing wheat at my YouTube channel available by clicking here or by searching YouTube for OSU Small Grains. In order to have full benefit, nitrogen must be in the rooting zone by the time wheat is jointing. Jointing occurs around the end of February in southern OK and around the second week of March in northern OK.
Moisture is required to move nitrogen into the rooting zone. Since precipitation is usually very limited in January and February in Oklahoma we need the nitrogen out on the field when the precipitation arrives. This, along with the fact that we have 5.5 million acres to cover, means that we need to get started in January to get everything taken care of in a timely fashion. If you are using the Sensor Based Nitrogen Recommendation system your yield predictions and nitrogen recommendations generally become more accurate as the season progresses; however, growers wishing to hedge their nitrogen bet could apply a partial top dress in January or early February and supplement with a second top dress just prior to jointing if SBNR recommendations call for additional nitrogen. Do not apply nitrogen to frozen ground. Nitrogen will move with water. If melting snow or frozen rain is moving to the ditch, so will nitrogen applied to the soil surface. On average it takes about 2 lbs/ac of N for every bushel of wheat yield. In addition, dual-purpose wheat requires 30 lbs/ac of N for every 100 lbs/ac of beef removed. You can subtract your soil test NO3-N from these total requirements. It is okay to adjust topdress N plans based on your current yield potential. When you submitted your soil test, you might have stated a 50 bu/ac yield goal which would require 100 lbs/ac of nitrogen; however, it is important to take a hard look and determine if this yield goal is still realistic based on your current crop status. I am not suggesting to adjust based on what you think the weather might do, but it is okay to take inventory and adjust your topdress N up or down based on current field conditions. The plant does not care about nitrogen source. A pound of nitrogen is a pound of nitrogen. Focus on getting the correct amount applied at the correct time, and choose your product based on price and application uniformity. Use a source that can be applied uniformly. In my experience, spinner trucks or buggies are generally the least uniform. Air trucks or streamers are the most uniform. Streamer nozzles almost eliminate leaf burn from UAN; however, leaf burn is generally not an issue until temperatures warm and/or you are applying fairly large amounts of UAN. 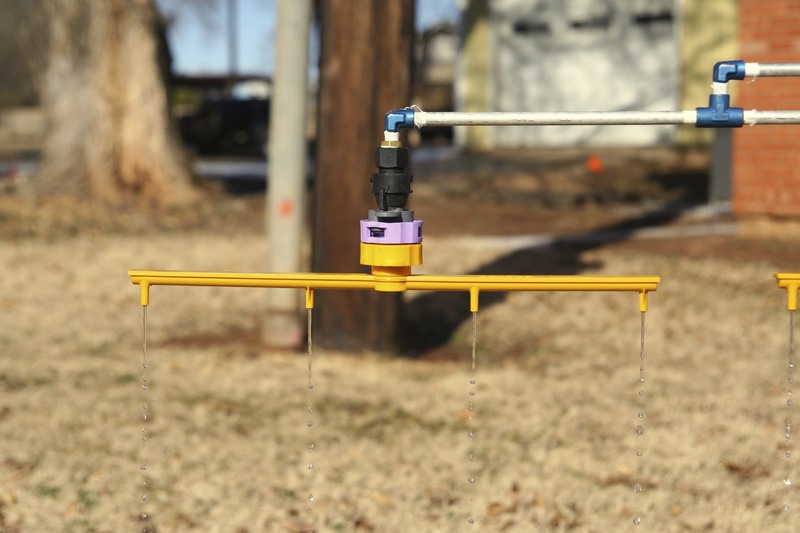 Stream nozzles are also not affected much by wind and deliver a uniform pattern in a variety of conditions. There are also some studies that indicate banding of UAN through the use of stream nozzles will reduce nitrogen immobilization on crop residue. All in all, I am a big fan of streamer nozzles. You cannot, however, tank mix herbicides when using streamer nozzles. 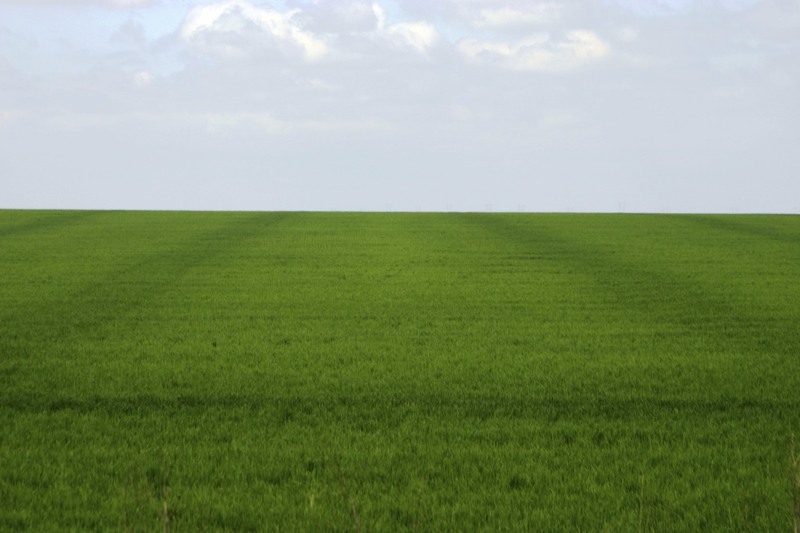 Poor nitrogen application can result in a streaked field. Some of the areas in this field were over fertilized while some were under fertilized resulting in wasted nitrogen and less than optimal crop yield.